The remote and wild northernmost edge of mainland Britain, Caithness has that raw and untamed natural beauty that's so ubiquitous to Scotland. From the towering clifftops walling the coast to the wild boggy moorland of the Flow Country, Caithness brims with mystery, ancient history and unpolluted beauty. Ideal for a hiking holiday or a romantic country escape, there is much to see and do, whether you're visiting prehistoric burial chambers, walking amongst standing stones or taking a guided tour around a whiskey distillery. 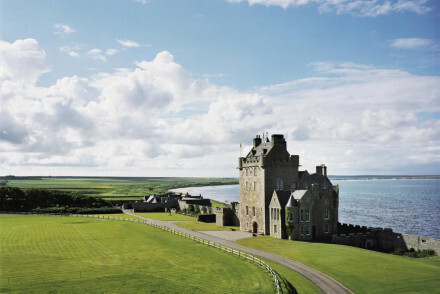 Our collection of best places to stay in Caithness are rural and quintessentially Scottish. Wick and Thurso are the main settlements in the region, both relying heavily on the fishing and tourism industries. Thurso, a close-knit small town full of charming old oakwood pubs, is the main ferry link to the Orkney Islands. It has a fabulous museum called Caithness Horizons - tracing the history of the region, its castles, natural landscape and Viking heritage - while also boasting two intricately carved Pictish standing stones. Wick has a few more attractions than its small-town rival Thurso, boasting the Pultney Town Brewery - an award-winning whiskey distillery - and the Castle of Old Wick, one of Scotland's oldest castles, an 11th-century ruin. Between the two towns are the Grey Cairns of Camster: appearing as two piles of rubble, these buildings once housed the dead back in 3500 BCE. They are bleak and beautiful to behold, much like the rest of the region, and encapsulate the sheer depth of Caithness' history. Scattered about the area are "brochs", the remains of prehistoric fortifications, and if you are hiking you will more than likely encounter a broch or at least some standing stones - something that Caithness has a lot of. The Achavanich Standing Stones, for example, are 4000 years old, stand at 2 meters high and form a horseshoe shape. The Hill o' Many Stones is another example, with over 200 standing stones that were allegedly used to trace the movements of the moon. You can't talk about Caithness without mentioning either John O' Groats or Dunnet Head, the latter being the northernmost edge of mainland Britain. Dunnet Beach, nearby, is arguably the nicest beach in Caithness and has a lovely forest behind it. In Dunnet, you can visit the Rock Rose Gin distillery - an award-winning distillery - and in John O' Groats, a tourist hotspot, you can eat some delightful ice cream from the longtime vendor there. If you like hiking, head over to the Flow Country, one of the last true areas of wilderness in all of Europe: sparsely populated, it teems with wildlife, birds and rare species of plants and has inspired painters for centuries. A desolate, low-lying peat-infested moorland, it is a truly spectacular place to hike. Head over to the Achavanich Standing Stones - they are 4000 years old - and muse on their original purpose. Check out the Grey Cairns of Camster, between Wick and Thurso, and see how prehistoric Man chambered their dead. Visit Caithness Horizons in Thurso for an immersive and detailed history of the region, and marvel at the ornate Pictish standing stones. Walk to Dunnet Head - the most northerly point of mainland Britain! Get yourself to John O' Groats, that coupled with Lands End, bears the most distance between two places in the British Isles. Go for a guided tour and tasting at the Pultney Town Brewery! Walk through the wilderness of the Flow Country. With so many attractions in the region this is a popular spot (especially durning the summer months), so to ensure a spot at one of the best places to stay in Caithness we recommend booking well in advance. 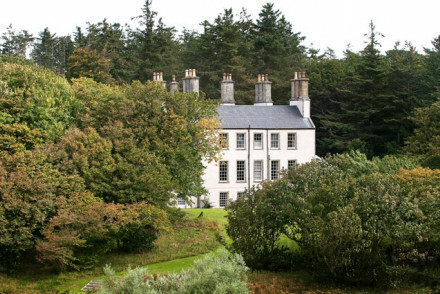 Forss House: built in the early 19th century, this picturesque country house stands within 20 acres of woodland. Full of antiques, warm and traditional rooms and roaring fireplaces, it is the perfect cosy retreat after a long day of walking or fishing. Fly to either Glasgow or Edinburgh and get a Scotrail train to either Thurso or Wick. Caithness is beautiful year-round but it does get cold! So plan a visit during the summer months when the temperature ranges between 8 and 16 degrees. Browse the options from the Highlands and the Islands. A charming 1810 country house hotel set in 20 acres of Scottish woodland. The perfect launchpad for all outdoor pursuits particularly walking, shooting and fishing. Spend the evenings with a choice whisky in hand by the fireplace. A great country escape. A majestic tower boasting a spectacular location overlooking an unspoilt beach. Beautifully renovated throughout. Antiques, chandeliers and rich hues stand perfectly against the property's original features. Expect a warm welcome - be it a hot chocolate or a whisky - and plenty of outdoor adventure. Country Escape - Boasting an unbeatable location overlooking the unspoilt Sinclair Bay. Sailing - Take a scenic boat tour to the Orkney Isles.